Water flows are consensually scraped from The Norwegian Water Resources and Energy Directorate, Glommens og Laagens Brukseierforening, and Friends of the Lysaker catchment. Weather observations and forecasts are provided by The Norwegian Meteorological Institute. Data on river sections, optimal water levels, and similar information is mostly based on these excellent guides. If you haven't checked out these guides yet, be sure to do so - they're free! The whitewater kayaking community is deeply indebted to their author for his efforts to create these guides. The printed Riverguide for Oppdal and around is also a nice source of information, but only for the Oppdal (and around) area. 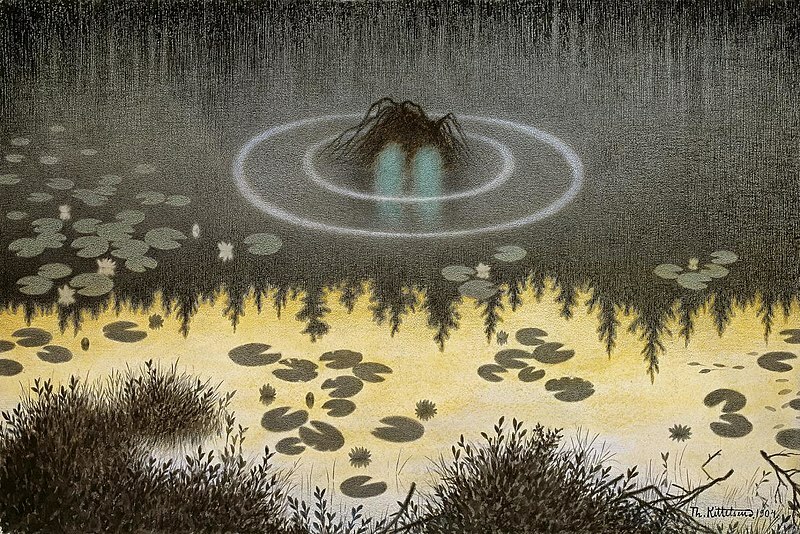 Nokk are male water spirits who play enchanted songs on the violin, luring women and children to get into lakes or streams. Not all of these spirits were necessarily malevolent; in fact, many stories exist that indicate at the very least that nokker were entirely harmless to their audience and attracted not only women and children, but men as well with their sweet songs. Nokken sings about his loneliness and his longing for salvation, which he purportedly never shall receive, as he is not "a child of God". If you brought the nokk a treat of three drops of blood, a black animal, some vodka or snus (wet snuff) dropped into the water, he would teach you his enchanting form of music. It is difficult to describe the actual appearance of the nokk, as one of his central attributes was thought to be shapeshifting. Perhaps he did not have any true shape. He could show himself as a man playing the violin in brooks and waterfalls but also could appear to be treasure or various floating objects. Nokk are said to grow despondent if they do not have free, regular contact with a water source.